From the confines of his prison cell in Istanbul, one of Turkey's greatest living novelists reflects upon hope, despair and the light literature can bring to even the darkest places. The destiny I put down in my novel has become mine. I am now under arrest like the hero I created years ago. I await the decision that will determine my future, just as he awaited his. I am unaware of my destiny, which has perhaps already been decided, just as he was unaware of his. I suffer the pathetic torment of profound helplessness, just as he did. Like a cursed oracle, I foresaw my future years ago not knowing that it was my own. Confined in a cell four metres long, imprisoned on absurd, Kafkaesque charges, novelist Ahmet Altan is one of many writers persecuted by Recep Tayyip Erdogan's oppressive regime. In this extraordinary memoir, written from his prison cell, Altan reflects upon his sentence, on a life whittled down to a courtyard covered by bars, and on the hope and solace a writer's mind can provide, even in the darkest places. 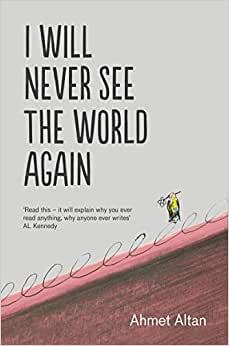 Start reading I Will Never See the World Again on your Kindle in under a minute. Born in 1950, Ahmet Altan, one of today's most important Turkish writers, was arrested in September 2016 for his work as a journalist. An advocate for Kurdish and Armenian minorities and a central figure in the Turkish cultural world, he is the author of five successful novels. He has been awarded the Grand Prix from the Akademi Publishing House, the prestigious Freedom and Future of the Media Prize from the Media Foundation of Sparkasse Leipzig and the International Hrant Dink Award. In February 2018 he was sentenced to life imprisonment by the Turkish state.